There is nothing better in reading than having author on whom you can rely to deliver a great story with each book. Clare Mackintosh has proved with her third novel, Let Me Lie, that she is one of those authors readers can count on, and she is wicked with the twist, too. When I read her first novel, I Let You Go, I was completely gobsmacked by the twist in that story. It's become a trademark of Mackintosh's to look forward to in each stand-alone story. Her deep psychological journey into the minds of her characters is often chilling, but always fascinating. And, there is the police procedural element that enriches the novels, too, bringing an authenticity to the stories. No doubt that Mackintosh's twelve years in the English police plays a part in this realistic feature. It is the suspense that drives all three novels, the secret just around the corner that you know is going to pop out at any given moment. What more thrilling reading can there be? Anna Johnson has had her life turned upside down during the last nineteen months. Her father, Tom, committed suicide at Beachy Head, throwing himself off the cliff into the waters below at high tide. Seven months later, Anna's mother, Caroline, follows in identical form. Both parents forever lost to the ocean, with only a wallet and a purse to identify them. Anna herself has had a baby in that time period and now lives with her boyfriend Mark, a psychologist, in her family home. With the year anniversary of her mother's death, Anna receives a hand-delivered card in the mail slot with the message, "Suicide? Think again." Anna has always found it hard to believe that her parents killed themselves, and this message suggests that indeed they didn't. She takes it to the police where it she talks with a former detective, now civilian employee, named Murray Mackenzie. Murray takes the matter seriously, but he decides to do some investigating before he hands it over to the official police heads. As Anna becomes more and more convinced that her parents were murdered, and Murray starts uncovering evidence of a shoddy police investigation or one that didn't go far enough, Anna starts to receive some strong warnings to quit digging into the past. With a new baby to care for and dealing with the emotions of reliving her parents deaths, these new threats have Anna in a tailspin. Mark is worried about her mental well-being and is suggesting she go back into counseling. And then, things explode off the page into the twists and turns Anna won't see coming, and neither will the reader. 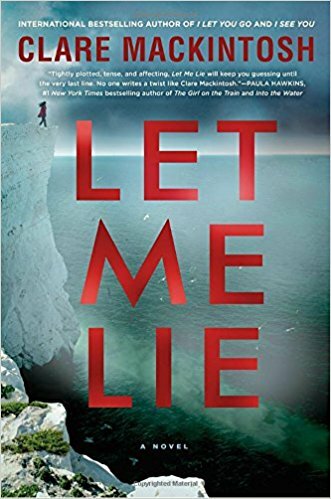 My advice in reading Let Me Lie is that you start it when you have a day or so to read, because it really is next to impossible to put down once you've started it. Clare Mackintosh has definitely done it again, so settle in and be prepared to be surprised up until the very last page. Thanks, Erica! Have you read Clare Mackintosh's first book, I Let You Go? It's still my favorite of her three, but each book is amazing.